For the adventurous amongst you who wish a more challenging experience in Israel, Susan Loves Israel can arrange a fabulous rappelling excursion at the Mitzpe Ramon Crater in the Negev. Rappelling or abseiling (from German: abseilen meaning “to rope down”), is the controlled descent down a rock face using a rope. Climbers use this technique when a cliff or slope is too steep and/or dangerous to descend without protection. 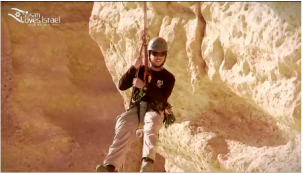 You can opt for a rappelling adventure in Israel in the Ramon Crater, the Judean Desert or the Upper Galilee in places like the Keshet Cave in Ma’arat haKeshet, Hanakik HaShachor, Nachal Yehudiya, the Kedumim Quarries, Luzit Caves, Nachal Kumran, Nachal Tamarim canyon, Nachal Tur, Nachal Hatzatzon, and Nachal Rachaf.